So, let’s talk for a moment about your YouTube channel’s “content-to-view” ratio and the importance of doing what you want… not what others want you to do… on YouTube. … and work to maintain your Fanbase on YouTube! When you start to accrue a fanbase through your animations, people will ask for specific things or watch only videos that are of a certain nature. … which also has a recognizable character, but fewer “likes”. Why?…. because it’s sad and depressing, even though it looks one-million times better… so why did I make the second video, at all? It didn’t contribute to my “view count” much and it hurt my status with the fanbase, overall. So, why?… the answer is because as an animator we can be easily drawn from what we wish to do into doing what others ask of us. 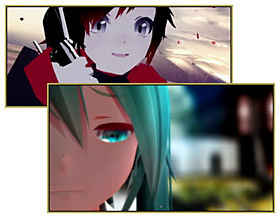 It goes from being fun… to being a chore… and once it becomes THAT, an MMDer inevitably stops doing MikuMikuDance animations. “So where is a healthy medium?” you ask. … Well, I’m not sure, to be honest, but for my channel, I mix up content that I want to do with content others want me to do: short funny motion data with truly heart-wrenching scene work. This may seem like it’s not that different from the statements above… but what it does for the human mind is important. It keeps MMD from being something that I don’t want to do and allows me to do it forever. I guess my point is that, as an artist, you need to do some projects for your audience… and do some projects for you. You need to make time for your personal projects or you will burn your creativity down to nothing. … but also, if you want to maintain your status on YouTube, then you need to do projects that the people, your fans, want. The solution I offer is: every two videos I want to do for myself, is followed-up by a video my fans are waiting for. I hope this little rant helps you maintain your passion, everyone! Well this post isn’t on the instructive side, there’s a reason it’s placed in “Random Thoughts and Visions” category, after all. There are plenty of other articles that may help you better. If you’re completely at loss, start with clicking “Step-by-Step Instructions” banner on the right side of the page.